Yes. I have IWS. Wendy; although not a Physician has diagnosed me with “Irritable Weather Syndrome” ! The Kiwis like to say that in Winter they have 4 seasons every day. And in truth it seems to be most of the year they have 4 seasons. A cold rain / mist, bright Sunshine, cloudy gray, and overcast with cold nights. Yep, they have adapted to it over the decades but not I ! When the Sun is out and shining I’m doing fine. I can play tennis, work on the boat, walk into town, do what ever. But! when it is to my way of thinking crappy out I want to hibernate. Now the Kiwis are not even bothered by the weather. It is raining. Not hard, not cats and dogs, not a frog strangler, but a good steady down pour. We watch as groups of locals are out walking the “loop” as they call it. The loop is a 4 km stretch that runs from the Town Basin; where most of the boats are moored, past our marina to the fish hook bridge and then back to the town basin. It is a nice scenic walk along the water front. But in the rain? Nope, rain doesn’t seem to bother them. the tennis clubs playing. it started to rain and I waited for them to clear the courts. In Florida a little rain made the courts slippery. Rather liking my bones and limbs remaining in fine shape, myself and everyone else retired to the sidelines. Nope, not here. The Kiwi’s kept on playing. The court surface here is all weather. It is much like an astro-turf, a very short fabric with fine sand mixed in. The court holds a lot of water before it puddles. We served heavy wet tennis balls. When the ball struck a heavily wet spot on the courts it slide instead of bounced. When anyone struck the ball water flew off looking like the rings of Saturn. If the Sun was shining; yes the Sun shines often when it rains here, you had a rainbow! In that scene I soldiered on. 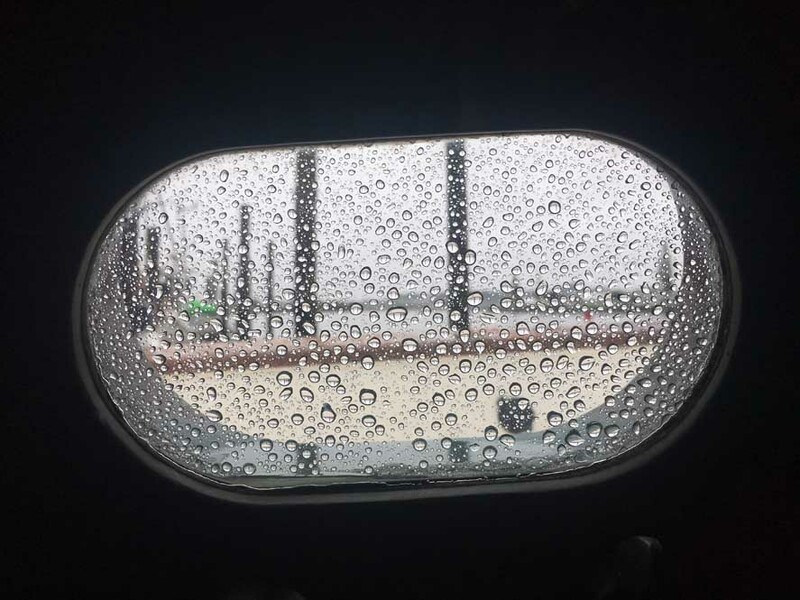 However, on most rainy days I crawl into a berth in the boat. I then do research on something; what more to buy, play chess, or just read the news making life even more depressing. Nope I’m not a person in love with the 4 daily seasons in NZ. I’m a fair weather person, I am an individual with IWS. This entry was posted on Thursday, April 12th, 2018 at 9:43 pm	and is filed under Places. You can follow any responses to this entry through the RSS 2.0 feed. Both comments and pings are currently closed.